Ilger.nl (Homepage) wrote: Again a great architecture shot....toning and perspective does it for me. Olivier (Homepage) wrote: Superbe travail. Photo ou peinture ? Bernhard (Homepage) wrote: Wow, a stuning compostion... I like it! Tom (Homepage) wrote: Very nice reflections. Cool photo. luan (Homepage) wrote: Excellent photo... where was it taken? Marie (Homepage) wrote: wouaw, quel coup d'oeil, c'est magnifique, ces lignes, ces reflets, bravo ! Frida (Homepage) wrote: Great point of view and very good reflection. Happy Holidays! Sobral (Homepage) wrote: Buon Natale! Merry Christmas! Olivier (Homepage) wrote: Very nice picture. Merry Christmas!! Arjan - PlasticDaisy (Homepage) wrote: Strong and crisply image! Love the subtle tones you used here! Jim (Homepage) wrote: Great angle and an interesting and effective composition. Andrés (Homepage) wrote: Very nice reflections and angle. Craig (Homepage) wrote: Fantasic reflections but most of all love the tone you have used here, it really gives the image a great finish! grant (Homepage) wrote: amazing! i like the limited color, the angle, the incredible detail. 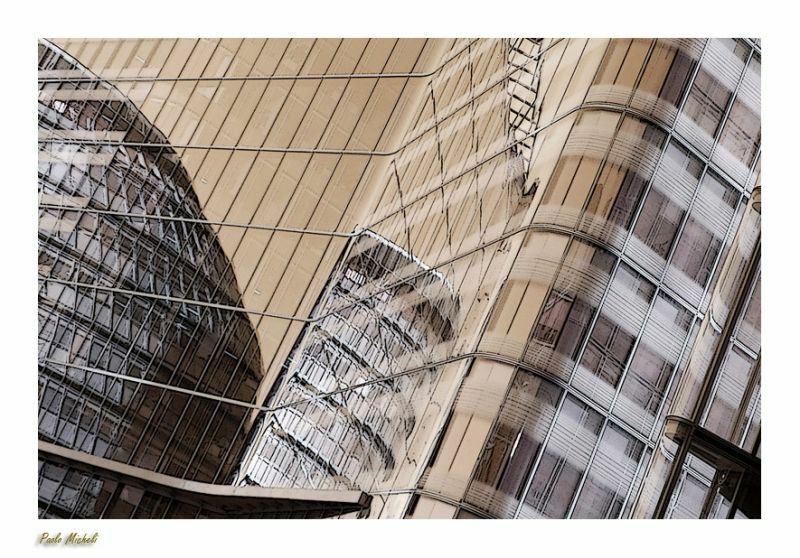 Andy (Homepage) wrote: Very cool reflections on this building! sherri (Homepage) wrote: Beautiful structure, beautiful capture. Merry Christmas. Michael Rawluk (Homepage) wrote: You have a great eye for lines. Have yourself a wonderfully Merry Christmas. Phil (Homepage) wrote: Great image and processing, I love the tones! Alex Caballero (Homepage) wrote: Seguimos con un magnifico encuadre, una sobervia composicion y unos reflejos bestiales, saludos y felices fiestas!!! Pere (Homepage) wrote: Es una imagen inquietante porque no terminas de saber dónde acaban los reflejos y comienza la realidad. Muy bonita. Saludos. Marcie (Homepage) wrote: Hard to create an abstract image out of such concrete structures. You've done it beautifully. WOW! Calusarus (Homepage) wrote: Reflection of a building… Nice one ! Omar (Homepage) wrote: Very dilly, nice play with the lines. Giovanni (Homepage) wrote: Bellissimo gioco di tonalità e riflessi!! Buon Natale Paolo! oldshutterhand (Homepage) wrote: Perfect architecture shot. Cerstin (Homepage) wrote: Superbe - you surprised again and again - like your postprocessing very much. Beeps and Chirps (Homepage) wrote: Yeah...that's awesome! Michael Skorulski (Homepage) wrote: Wonderful reflections in this fine crisp image. 613photo (Homepage) wrote: Another great shot, Paolo. As others have said I'm a big fan of the lines and tones in it. Also like the fact that it's askew. Rolf Kaul (Homepage) wrote: perfect Photoshop-works,...I like it!!! cako (Homepage) wrote: Beautiful reflections in this photo. Great architecture, great shot ! Elaine- (Homepage) wrote: i love the way the dome building looks amongst all the lines... very cool shot!! Shirin (Homepage) wrote: Lovely tones. One could follow every line and get to the beginning of several new lines! Love the angle! Krims@nline.be (Homepage) wrote: Is this another part of post 'Metroplis' ? Which city is this ? Nice effect, great lighting. beanow (Homepage) wrote: Super compo nad geometry! Great job!